We have all manner of Bits and Bytes to share, the majority of today’s tidbits are fun and frivolous, with little or no redeeming social value whatsoever. We begin with an item we mentioned yesterday on Facebook, with apologies to our friends from that venue, we simply must show it again. 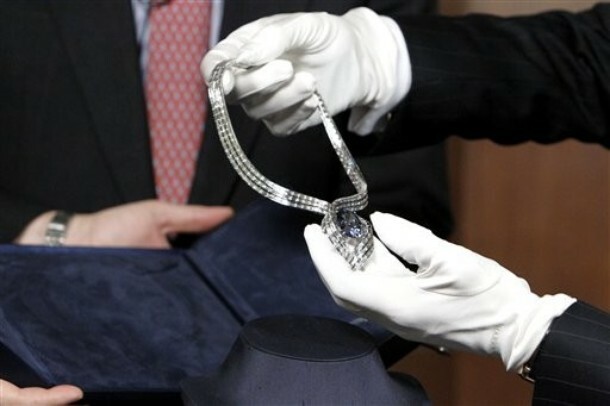 For only the fifth time in its history, the Hope Diamond was moved from its place at the Smithsonian. 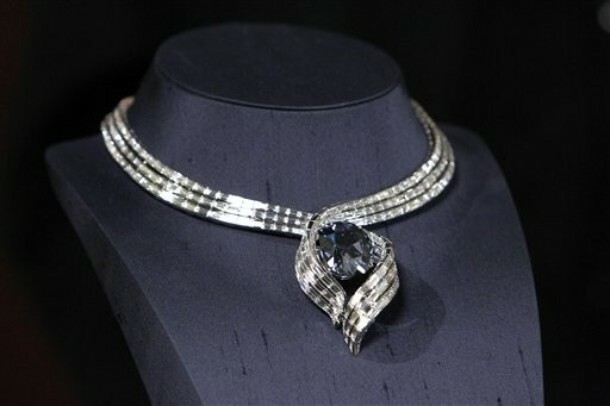 The legendary piece was moved to the Harry Winston 5th Avenue flagship for a gala Tuesday night. It was also the first time the stone was seen in its new temporary setting, some readers may recall that the design was selected by the public through an online voting process. This photo gives a better sense of how truly immense the stone is. Celebrities on hand for the big party included Halle Berry and designer Rachel Roy. Perhaps the only thing discussed as much as the famous stone was the clothing selection made by actress Leighton Meester. The Gossip Girl star’s lacy jumpsuit from Marchesa was sheer, there is nothing earth shattering about that; unfortunately we are all seeing far more of the “too little fabric, too much flesh” syndrome. It was a surprising miss from the young actress, for if she is criticized at all by the fashion media, it is generally for playing things too safely, too conservatively. One of Ms. Meester’s costars is known for frequently wearing more daring looks; that may or may not be a factor in Blake Lively landing yet another Vogue cover, this time for a special edition. The actress is featured on the cover of Vogue Best Dressed. To see the Top 10 on the magazine’s list, click here. Next, a few new books, both appropriate for gifting. The first showcases creations by Louis Vuitton. Here is a look at the ‘Deluxe Edition’. This version will only be available at Vuitton stores and through the company’s website. The other volume we want to mention looks at interior design, the content all comes from T&C, one of TP’s favorite magazines. At Home with Town and Country is the first home book from the magazine, the book offers a look at some of the magnificent homes and living spaces seen in the magazine. This one was released in September, so it is available for purchasing now. Also today, it seems Neiman Marcus is embracing the prep style aesthetic, the NM Guide to Prep claims to offer “everything you need to achieve true prep status”. The guide is merely a collection of merchandise, with an an array of ideas for your MOTH (Man of the House). There are some obvious choices on the list, like the Hunter Boots and Neiman’s own brand of Pocket Squares. The Lacoste Long Sleeve Polo and perhaps even the Armani Ties would make the cut. But the Gucci Embroidered Crest Cardigan or the Burberry Wallet? To quote Nancy Reagan, just say no. “As long as there are private boarding schools, Brooks Brothers button downs… and girls lacrosse there will be preppy kids with stupid names and nice cars. What would “Muffy” drive? On that topic, g’bye until next time! Hello-Hello, and welcome to the Monday mayhem here at the Prepatorium! We are ever so harried today, we apologize for a completely disorganized post. We begin with word on the dress worn by entertainer Carrie Underwood at her wedding last weekend to hockey star Mike Fisher. Monique Lhuillier created the Chantilly lace and silk organza gown worn by Ms. Underwood for the ceremony. The singer’s reception gown was also done by the designer, who shows both dresses on her Facebook page. As seen in the pictures, People magazine and sister publication People Style News have the story on the bridal gowns and accessories. According to StyleList the shoes were by Stuart Weitzman, his white satin Avalon platform pump. (If it appears to have a pink tone that is because it was embellished with pink crystals.) The bride wore a feather and crystal ban.do headband. Notwithstanding our thoughts on daytime glitter and frou-frou, the young entertainer looked beautiful, and the two make a lovely couple. We may have previously mentioned this, the sleepwear line Norma Kamali is doing for Walmart; today’s WWD story had a few images from the collection. The new line debuts online October 10. We have previously shared links to Lilly Pulitzer and Vera Bradley for those wishing to perk up their desktop via free downloadable designs. Our friends at Boatman Geller are also offering some of their most popular patterns as wallpaper. The available designs include a pattern we adore, Espadrille Preppy Stripe, delightful for your computer or your tabletop! In today’s “We are not Worthy” category, two public ‘Thank You’ notes. The first is to the gifted and delightful Miss LPC, perhaps better known by her blog, Privilege. This always stylish writer was much-too-kind when composing a recent post, we can only offer a public expression of gratitude in return. When we grow up we hope to have a smidgen of LPC’s talent and skill. Our other thank you is for the ever-so-proper (and loads of fun) Miss Janice; specifically for sharing pictures of a recent soirée she hosted. Some of Miss Janice’s Lilly Pulitzer tableware came via a blog contest we sponsored with Muffy Martini, the prize was a complete set of the Loco Patch party and tableware items. Thank you for sharing Miss Janice, we always enjoying seeing how people actually use some of our favorite Princess goodies! Does J. Crew ‘Help Preppy Go Euro’? Hello-Hello, and happy Monday! We hope everyone enjoyed a pleasant and restful weekend. Today we invoke ‘brevity is a virtue’ as our modus operandi, things are a tad frenzied here in our corner condo at Princess HQ. We loved the photo illustration that accompanied the article. Writer Virginia Heffernan deftly examines the company’s move toward a different aesthetic, referencing a specific sailor shirt featured on Crew’s website. “The shirt is sporty and thus not un-American, while also signifying “Paris,” a new concept jcrew.com has been audaciously colonizing. The site twinkles with references to France and haute couture, and recently it has positioned dissipated and mysterious Euro-type models in the slots that used to be reserved for “J. Crew models” — fresh-faced, wholesome strawberry blondes. We hadn’t really noticed a change in models, but then, we spend very little time on the site or looking at the catalog. Have you noticed a drift toward a more European look in the models? Those days of preppy names in print only at birth, marriage and death are long over. Now they can’t stop . . .musing. For modest laughs: To the Manner Born, WASP 101, Tickled Pink and Green, Muffy Martini, Pink Washingtoniette, 2PreppyGirls and Summer Is a Verb. Reading this group of names at the end of the story had us grinning ear to ear. Congratulations to all included! The story is fascinating, click here to read it in its entirety. A related note of interest, J. Crew is doing their Final Sale promotion again, offering an additional 20% off sale-priced merchandise. The promotion runs through this Thursday, July 15. Use the code EXTRA20 at checkout to receive the discounted pricing. We apologize for the brevity of today’s post; the flood of orders for these…. Has prompted the creation of one of these stacks everyday here at the Prepatorium, as the Consort and I our immense staff of Princess Pixies get the Lilly Agendas headed out the door! Heaven only knows what the stack of Lilly iPhone Covers will look like when they are shipped in early August, eeek! Hello-Hello, and Happy Day to all, especially those enjoying a day off, a little respite from their normal schedule! We must begin by sending great good wishes, big smiles, hugs, prayers and lots of love to two of our favorite bloggers who started on a new path this weekend…. Congratulations to the one and only Muffy Martini and Daisy JD (Just Daisy), they married the loves of their lives Saturday. The line is being moved exclusively to Penney’s. Both the men’s and women’s labels are making the move; if things are going well after five years, Penney’s can even buy the name. This brings comparisons to American Living, the Polo Ralph Lauren brand sold at Penney’s. Below, a fashion look and a table lamp, both from that collection. It’s unlikely there is much brand dilution with this line; most retailing insiders believe the line really bears little resemblance to standard PLR merchandise. Other retailers have done well with designer collections specifically for their customers, such as the Simply Vera by Vera Wang and Dana Buchman lines at Kohl’s, and Tommy Hilfiger is now sold only at Macy’s or Hilfiger stores. From a big picture perspective this also allows the Claiborne company to focus more attention on several brands many readers are familiar with: Kate Spade, Lucky Brand Jeans, and Juicy Couture. We have a few more Pretty in Pink things to share, starting with an extra cute pair of Keds. The Keds Champion Pink Ribbon sneaker benefits the Breast Cancer Research Foundation – the company is donating 100% of proceeds to the BCRF. Speaking of shoes, how about these Ragg Kids Puppy for infants and toddlers? Or these Bibi Kids Laceups, also for infants and toddlers? If TP and the Consort had been blessed with human children we would be bankrupt; every single cent would be spent on shoes for the little ones, they are simply too cute! Another delightful find, Kate Spade’s Bon Vivant Lilia, actually something of a bargain right now. Because of the chilly temps outside, we have to share the Pink Funnelneck coat from Old Navy. We leave with a look at the next generation Armani phone. It does look sleek and elegant – dare we say understated? However, we’re more than content with our iPhone tucked into its shocking pink case and we also have a greater understanding of just how easily one might become addicted to dependent upon the technology. Until tomorrow, we send smiles to each and every cherished readers! 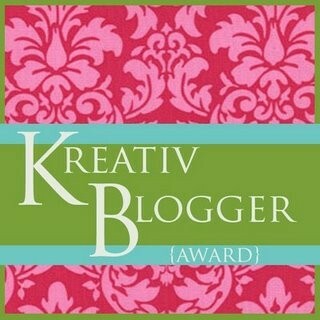 Oh my goodness, the witty and wonderful “Well I Do Declare” has been ever-so-kind and dubbed The Princess a Kreativ Blogger! Whoo-hoo! While feeling utterly undeserving, we say “Thank You” and share 6 blogs that make our day brighter and better. Tickled Pink & Green is always fun, especially her photo of Barack Obama and Sarah Palin in their Dancing with the Stars debut. Mom x 2 is an outstanding writer who shares the wit and wisdom that help us keep things in perspective. Lipstick at the Mailbox somehow (and we don’t know how) manages to find the time to create posts that are sheer bliss to read. The Jewish Girl in WASPS’s Clothing is an extraordinary writer with insight usually found in much older individuals. We think she has an old soul in a young body. In our dreams we write like this. The Southern Social is planning parties, sharing social activities with readers, and loving life in Atlanta. Muffy Martini is guaranteed to bring a smile to your face while also providing some perspective on preppy life on the west coast. We need to get ourselves updated here at the Prepatorium. We have fallen woefully behind on reporting some of Target’s newest collaborations, as they are blockbusters. Both are by what many in the younger generation would call ‘hip’ designers, both are worn by a certain Presidential candidate’s spouse, and both will hit the Boutique Tarzjay smack-dab on a holiday. The clues are in the photos that follow; in the first Michelle Obama wears a dress by Designer Number One. His name is Thakoon Panichgul and Michelle Obama wore his creation (seen above) on the final night of the Democratic convention in Denver. She also wore a Thakoon design to the presidential debate at the University of Mississippi in September. 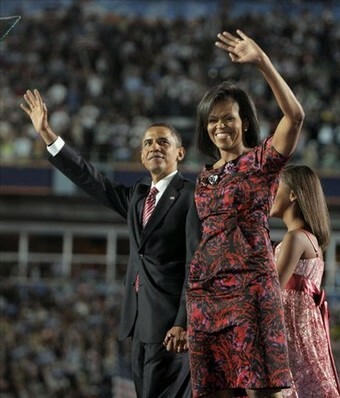 Below, the Floral Inside-Out dress as seen on Ms. Obama and then at the eLuxury site, available for purchase for $1250. Now, in this next photo she has on jewelry from Designer Number Two…. 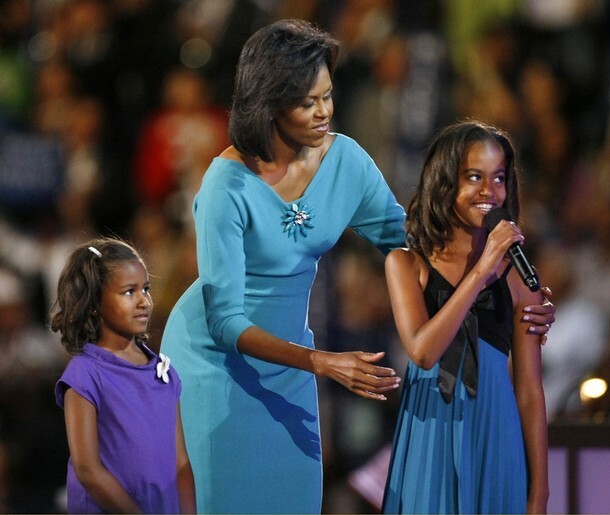 The Erickson-Beamon brooch is front and center on Ms. Obama’s dress (seen with daughters Sasha and Malia) worn at the Democratic Convention in Denver. 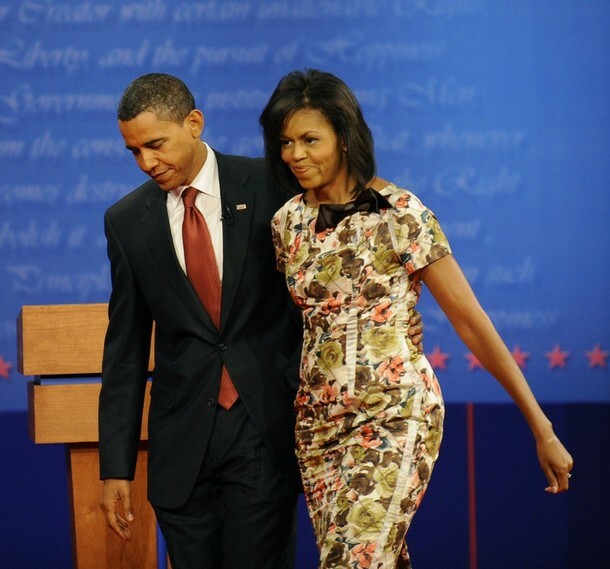 BTW, the dress was one of the pieces worn by Ms. Obama from Chicago-based designer Maria Pinto. The brand, named for designers Karen Erickson and Vicki Beamon, is only the fourth partner selected for a jewelry collaboration with Target. Here we show the Erickson Beamon Flower Brooch in blue, available at Blue Bee for $303. As for Erickson Beamon, their collection hits on Valentine’s Day next year, a day that is probaly a little more manageable for most in terms of shopping. Here we see a more elaborate piece from the “I’m with the Band!” Collection, featuring crimson leather intertwined through the 22″ triple chain. This is available at Electric Couture for $658. Next we show something Ms. Obama is probably more likely to gravitate toward, the Gold Leaf Cuff at Net-a-Porter for $525. Moving on from the wacky world of politics to the bizarre land inhabited by Gossip Girl. Perhaps the Gossip Girl production company has all of the extras they require for the big party shoot this week… but perhaps not. If you are looking for some pocket change, the New York Craig’s List has an ad for extras to shoot Gossip Girl party scenes this week. The compensation is $85 for a ten-hour day, but one is required to BYOW, Bring Your Own Wardrobe. We’ll be looking for you on the little screen. AThe Princess feels compelled to point out that Lilly Pulitzer isn’t the only ‘preppy’ brand celebrating an Anniversary, although we have spent a bit of time remarking upon that topic. Now however, we turn our attention to another iconic brand marking an important milestone, Lacoste, celebrating its 75th year. And the company wants you involved in the party! The ‘Lacoste Future Site’ is fancy, flashy and lots of fun if that is your sort of thing. “For Lacoste’s 75th Anniversary Imagine 75 Years From Now in 2085” is the opening request, followed by some fairly futuristic tennis! With other slogans like “Let’s Reinvent the Game” and “Lacoste – As You’ve Never Seen It,” this is a site that is highly interactive, asking you to suggest ways to complete slogans, helping you send Lacoste video email to friends and more. It also offers great ‘wallpaper’ for your desktop, screensavers, and a futuristic video, all done with awesome animation that is amazing to watch and worth at least a nano-second of your time. Perhaps the image below gives you a sense of the site’s look. This may come as quite a surprise (um…not exactly), but there is a substantial amount of merchandise commemorating the Anniversary that you can actually purchase. Let’s take a peek. First, we offer the 75th Anniversary Retro Fit Polo at Nordstrom in what we would call a classic and understated white (or black) with the logo embroidered in discreetly matching thread. Well, almost that, but unfortunately not totally that, as evidently the Lacoste Crocodile has been put on a Barry Bonds steroid regimen remarkably healthy diet; it is now enormous. Gigantic. This is probably why it is referred to as the ‘Exploded Croc.’ There is also the Essential 75th Anniversary Eau de Toilette available at Bloomingdale’s for that special someone. Of course, when The Princess thinks 75th Anniversary, we always think stretch pique, don’t you? (Bad Princess, very bad.) This is the 75th Anniversary Button-Front Stretch Piqué Halter Dress followed by the 75th Anniversary Pique Polo, both available directly from Lacoste. Perhaps a little zippier in style are the two versions of the 75th Anniversary Sneaker, one seen below courtesy of myairshoes.com. In other Lacoste news, there is no way we can leave this topic without sharing at least a few photos of the 2008 Lacoste Fall/Winter lines, as some of the pieces are just stunning and TP would love to have them on hand to snuggle into when the snow starts flying! Moving beyond all of today’s Lacoste updates, let’s talk about positive news from J Crew: word they will open not just a second men’s-only store, but they are scouting locations for a third standalone men’s shop. We have mentioned previously the planned opening of the Tribeca men’s J Crew now under construction in The Liquor Building, a fabulous location for this sort of endeavor, albeit a tad on the smallish side. The company will add a second Men’s store next to an existing mall-based store in New Jersey, and they are actively looking for their next site. Michigan, Denver, Oklahoma City, Missouri, Oregon. Ummm…. not to be totally tasteless here, but if we are speaking about having only one billion, then I guess the first thing might be to call the financial people and ask what happened to the rest of my inheritance. Purchase the City of Chicago and if that is not possible, acquire a meaningful suburban community. Following appropriate transfer of deeds and other dreary paperwork, rename the area ‘Prepoplis,’ and get in touch with Lilly to commence planning the Earth’s first completely pink and green habitat. Build an Olympic size ice rink in the back yard. Buy a professional baseball team. Honestly? Of course it would be to do the philanthropy and volunteer thing full-time. And in the “Just Because We Can” category this evening, we wanted to let you know The Princess has found a very stylish time waster that you simply must visit: ColorFlip. A colossally useless endeavor in many ways, but one we felt you might enjoy on some level, so there you have it. Happies to all!